11. Papillon Around the World in 80 Stitches - Parts 1 to 3 completed. Part 4 well on its way to completion. 12. Nora Corbett Trick or Treat Fairy - not started. These were delivered to the Bride today, she loved them! Now I have an empty nail in my conservatory. So that's a total of five Bronze medals, four Silver Medals and two Gold Medals. According to the table of medals, that means I am Kenya. Please feel free to sing the Kenyan National Anthem and salute "our" flag. I won't attach photos of all the "athletes" this time, they are all featured somewhere in the previous eight posts so have a look back. Hmmm, not so sure about all the finishing skills needed for that lot. 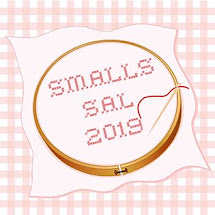 I think I'll stitch to stitching smalls for my scrapbook. Finally, I will be emailing the last postcards in the Summer Postcard Blog Hop out later. 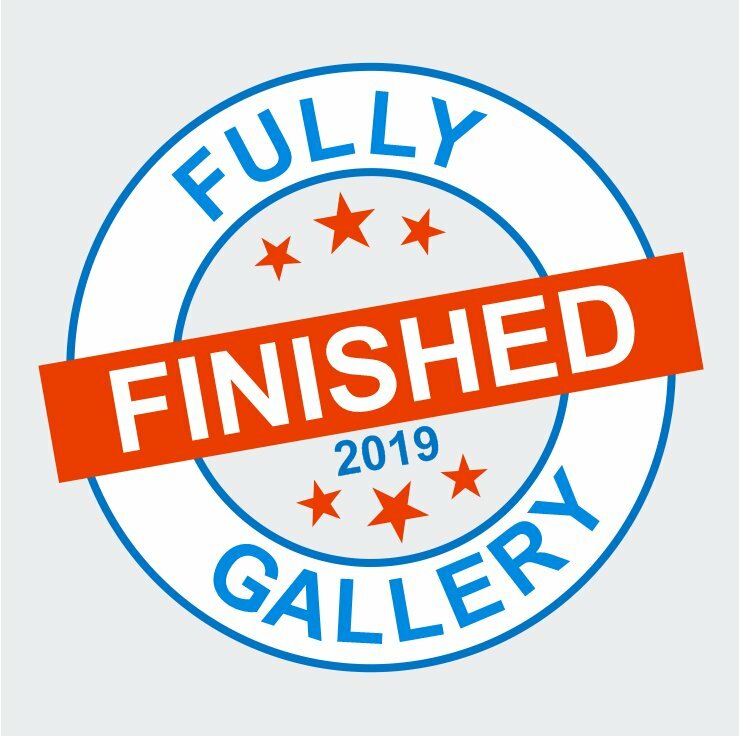 A Big Thank You to everyone who took part. Watch out for the Hallowe'en Hop in October! 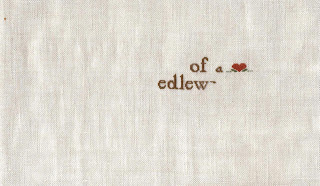 Well done to everyone who guessed the name of the Mystery Stitch and especially well done to Chiara, Needlework Geek of the Week, who guessed it from only the two letters "ed". Here is my progress so far, anyone who cannot guess which design it is now needs to go back to Needlework Class 1 for Beginners LOL. 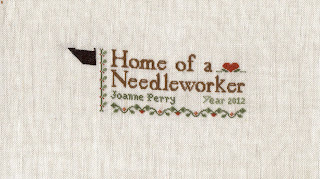 It is, of course, Home of a Needleworker by LHN. 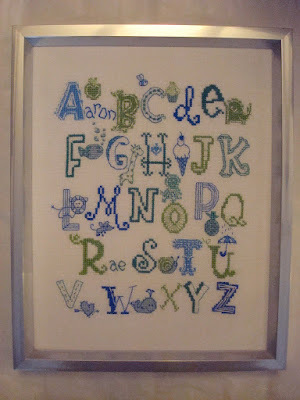 Nic the Obsessive Cross Stitcher passed the chart to me last year along with the threads. She had a giveaway on my Birthday and I think I scared everyone else away by saying I HAD to win because it was my Birthday!! 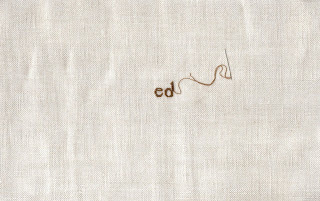 It looks a little "saggy" because it's stitched on linen and scanned on the printer! It is straight in real life. Amazingly, someone else is having a Giveaway on my Birthday this year too. It's Sarah the Crafty Moo, check it out there. But you can't win because it's MY Birthday! I've made some good progress on Papillon Around the World this week, I emailed pictures of Parts 1 and 2 to Yvonne for her Gallery and have now completed Part 3 plus a good bit of Part 4. I need to stop soon to stitch on the two Round Robins in my possession then I'll either continue with ATW or be starting Thine is the Trick or Treat. Evalina has suggested we SAL as she's started already. It will be fun to SAL with someone else, it's a great way to keep up with a project. Finally I've just sent another postcard out for the Summer Postcard Blog Hop. Gracie's card went to Lesley. Check out her blog soon to see the picture and message. There's still time to get a photo in if you want to join in, click on the sunset picture to the right for more details. The next event will be the Hallowe'en Trick or Treat, (similar to the Easter event) so watch out for sign up details in October. Today is Cucki's Birthday. If you've visited her Stitching Cove you already know her and love her. If you've never been there before I whole-heartedly recommend it as a great way to brighten your day and make you smile with joy. Holly, I especially loved your sweet peas!! I call my boys that sometimes as a term of endearment. An elderly lady heard me and said "What a lovely name for such a pretty little girl". Actually he's got a normal name and he's a BOY!! But I said it more politely than that LOL. I've been stitching away on Around the World and if "Sweet Pea" hadn't been up until midnight last night I'd have finished Part 3. Never mind. That's what happens when they have a nap during the day. May I just say, I hate Lazy Daisies! Though they do work better in two strands than in one. You can also really see the difference between a single strand for bs and a double. The two shapes second and third from the left only have one strand whereas all the others have two. I'll be going over those shapes again so they all have two strands. I also received this anazing piece of fabric from Karen as a RAK. Poor old dear can't see to stitch on 40count so she sent it to me! Here's a picture of the fabric (colours as accurate as possible) and also the chart I'm planning to stitch on it. What do you think? I need a nice black thread a little thicker than one strand of DMC as I'll be stitching over 2 and I'm not sure if one strand will cover well enough. Any recommendations gratefully received. I don't mind spending a little more for this project. Within reason. Not £10 a skein! There was a lovely little stitch counter in with the fabric too. Do you think Karen's hinting I'll need one? LOL. Finally, here's an update of the Mystery Stitch. Any ideas? All will be revealed next time as the words will be completed and it'll be obvious to everyone! This last weekend was the monthly International Hermit & Stitch Weekend hosted by Joysze of Random Ramblings. I take part every month but don't always do a specific blog post about it! This weekend I pressed on with Papillon's Around the World in 80 Stitches (see TUSAL post for latest pic). I have now completed all the outline for the 5 parts released so far, all the pale green backstitch and nearly all of the speciality stitches on Part 2. However I have decided the pale green looks better in 2 strands so I have to go over that again with another strand! I managed another small finish, a freebie from Gazette 94, three seasonal hearts. I completed the Autumn and Spring Hearts in their relevant season and have now finished Summer and framed all three together. There is a Winter Heart but it's a little different in style so I might make an ornie and display it alongside. The frame came from QD, the glass is black with the heart shapes left clear. They were stitched on one piece of 36count evenweave using the recommended DMC except for the greens which I changed to use the same three shades on each design. They had to be on 36count so they would fit the spaces in the frame. As I finished these this afternoon I was left with a decision about what to stitch next. I could have started making up an ornie for an exchange I'm doing or making an early start on September's Birthday cards or I could start something completely new. Guess which I did? This is being stitched over 1 on 28 count linen. Bonus points for anyone who can identify the design!! It's a popular one around the Blog-o-sphere so someone might recognise it. The person who sent it to me will know for sure! Finally, I got my eyes tested today, my "good" eye is minus 7.something and my "bad" eye is minus 8.something. The optician asked me if I wanted vari-focals or reading glasses but I declined and explained I just hold my needlework very close to my face which means I can stitch on any count no matter how high. If I had reading glasses I'd be restricted to 28 or maybe 32. 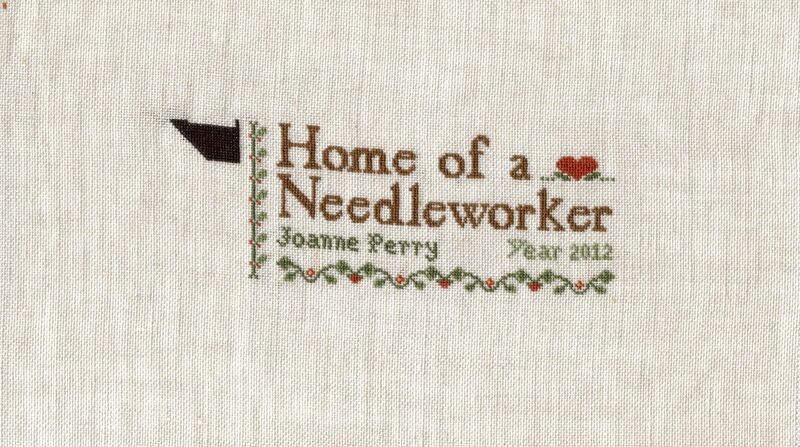 I just have to be careful of the needle stitching so close as I have scraped my nose with it before now!! Here is mine, posing with Papillon's Around the World in 80 Stitches and the lovely folder I use to keep all the ATW80 charts in. I decided it would be easier to have each page in a separate plastic sleeve in a folder. I was lucky enough to win this lovely kit from Linda the Keeper of the Crowes to celebrate her First Blogaversary. The chart uses standard DMC threads but Linda has subbed the two main colours for these gorgeous Gentle Arts threads. I have used the gold one already on an exchange I'm stitching (so you can't see it yet!) and it's very subtly variegated. It's so hard to get these different threads without having a proper LNS so it is lovely to win some. I received some from Ruth the Musing Badger a while back and have used her Cherry Bark on the same exchange too. This is another one of Brooke's Books monthly cakes. The original has a big A (for August) on top of the cake but I missed it off because Jan's name doesn't begin with an A! The border isn't a variegated thread because I didn't have a nice pale blue, instead I did batches of about 20 stitches of 5 different blues all the way round. I'm planning on stitching all 12 (I did June's for Joyzse already) so if you'd like an e-card of your month just let me know when your Birthday is. E-cards are so environmentally-friendly and also save me on postage! Half my spending money seems to go on postage these days! And muffins. They are three for £1 at the Post Office corner shop and it's the Large Boy's reward for walking there with me! So that's a total of four Bronze medals and two Silver Medals so far. According to the table of medals, that means I am India. Please feel free to sing the Indian National Anthem and salute "our" flag. This is the Band from Celtic Leaves by Northern Expressions Needlework. I love the variety in this RR, it's not just Ladies, it's dragons and unicorns and geishas and fairies and flowers and Christmas and everything! The other has not yet been sent, so you'll have to wait for that one! The same goes for the giveaway prize and the Needlecraft Haven freebie challenge. You'll see them all on the final Theme-a-licious update on the 31st. And finally, some sad news, for those who haven't heard; the designer Marilyn Leavitt Imblum has passed away. She was the designer behind Lavender & Lace, Butternut Road, Told in a Garden and also Nora Corbett's mother. So she leaves an amazing legacy behind her both in her designs and her talented daughter. I think it is appropriate to show a photo of L&L's Angelica. 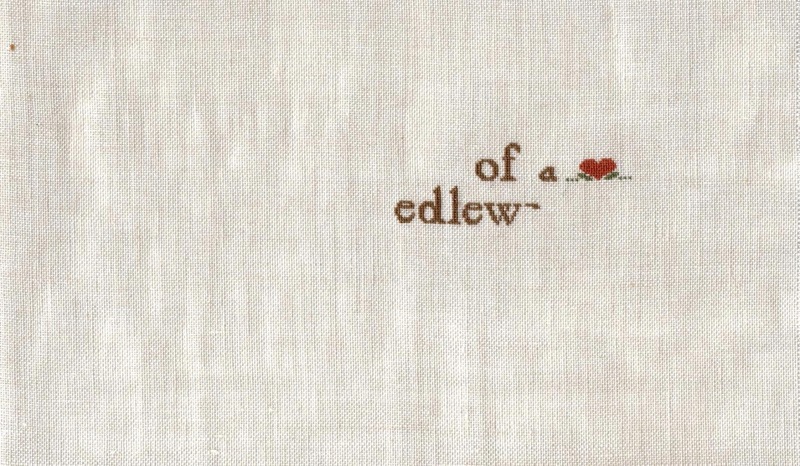 I stitched this while my own Nana Ivy was passing away (literally, in the room with me and my stitching) and it hangs on my wall in her memory. She was an August Birthday and it seems fitting that Nora has just released August's Birthstone Fairy Peridot. Nearly all my stitching so far this month has been for other people! What with Round Robins, Birthday Cards and Giveaway prizes the only thing I'll be keeping is the Papillon ATW80. I do enjoy stitching for other people, especially other stitchers because they are so appreciative of the love, thought and effort that goes into each piece. The down-side is that you can't do "Show and Tell" immediately! Anyway, it's Kathy A's Birthday today (she's 21 and then some). 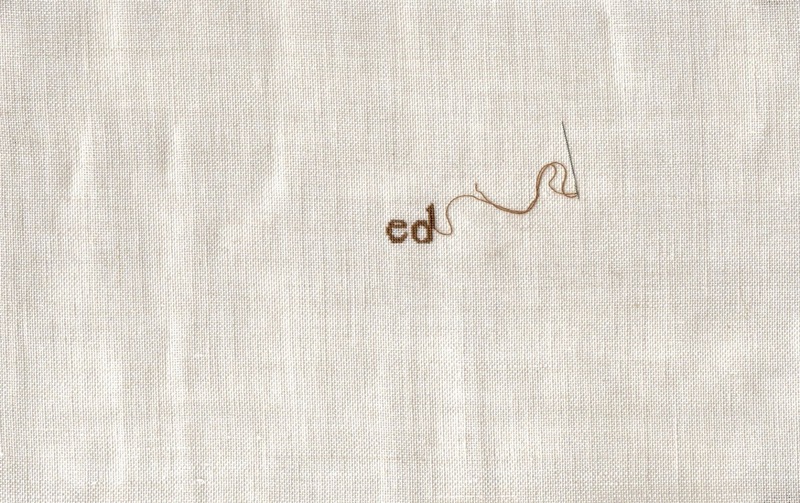 I stitched this initial K for her last month and posted it off. She emailed me to say it had arrived and Thank You so I can now show you all. Then you can pop over to Kathy's blog and say Happy Birthday too. You might know Kathy as Drew's Grand if you're a regular on the forums too. This was another piece of Serendipity! Recently I found a cross stitch book which had been put away in a different box to all the others when we moved. 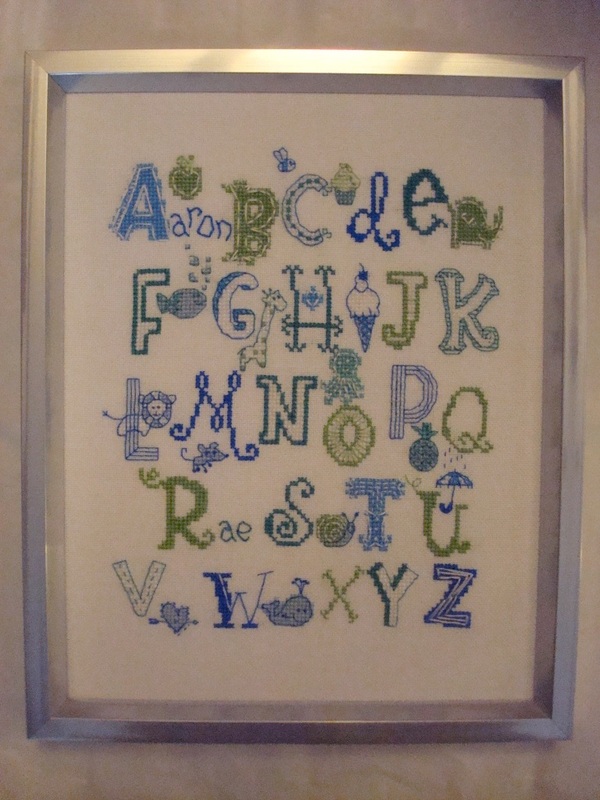 It had the chart for a lovely medieval alphabet with little flowers in the style of an illuminated manuscript. However the K didn't look like a K on it's own! It was fine when you could see the whole alphabet but looked more like an H seen in isolation. So I got my Celtic Cross Stitch book out and found the perfect K. Which was too slim, I needed a square K. So I got my graph paper and made it into a square K and voila! A card for Kathy. It's stitched on 32count white evenweave using DMC threads and mounted on a really shiny metallic card. I had to take the photo at an angle as it reflected me in it! 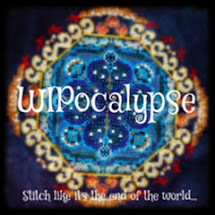 The Summer Postcard Blog Hop is continuing on round the World. Cucki's card went to Gracie last week. 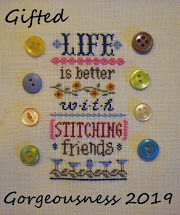 Here's Gracie's Blog - Needles, Pins and Dragonflies so you can pop over and see the picture and message. I have a couple more cards waiting in the wings but would love more to send out. If you'd like to join in then click on the sunset link to the right of this post. It's a fun and free activity! Talking of Gracie, remember Madame Muriel the Travelling Granny? She left me for the sunny climes of Arizona and now she's arrived in Italy to stay with Chiara and the Grey Tail. Here's her arrival announcement. I bet she's having an amazing time there. I am quite envious! I completed not one but THREE of the projects on my list of 12 which actually quadruples the number of finishes! I have started five more and only have three which haven't got any further than buying fabric. This is a Blackbird Designs chart called Bluebirds which Margaret sent to me along with Madame Muriel. I tea-dyed a piece of 28 count evenweave and used the DMC conversion provided. Mostly. I blended the hill then used one green for the leaves and the other green for between the flowers. I also used 931 for the birds rather than 930 which was a little dark. They look quite bright in this photo because it was taken in the conservatory rather than our lounge. The colours are a little more muted in real life. The chart for the Noah's Ark is off to Cucki as she admired it so much and said her son loved it too. It's Cucki's Birthday this month so it'll go off to the Stitching Cove with a card. Not so good, in fact nothing again! See yesterday's post for my single holiday themed finish, BRD Woodsy Winter. Finally, back on this post I asked if you ever send pictures of your work to the designers. This is something I've started doing this year and I'm so pleased I did. I got a lovely email from Belinda the Blue Ribbon Girl who is now a follower. She's even posted my Woodsy Winter on her FB page she liked it so much. So if you've loved stitching a design, let the designer know, they love feedback and photos. And guess what, they love stitching and blogging too LOL.